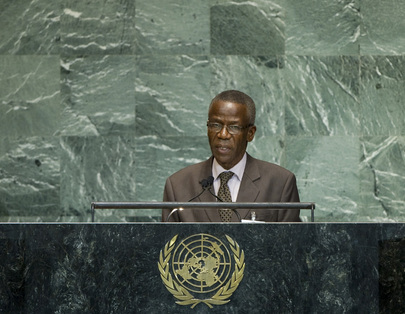 EDOUARD NIANKOYE LAMA, Minister for Foreign Affairs of Guinea, said the strengthening of democratic institutions and the re-establishment of territorial integrity were major challenges that must be met in West Africa, particularly in Mali, the northern part of which had been occupied for several months by terrorist groups and rebels. He reiterated Guinea’s support for the initiatives of ECOWAS and the African Union in pursuit of solutions to that crisis, stressing that its consequences could be devastating to other countries in the subregion. In that regard, Guinea supported Mali’s request to the Security Council for the rapid deployment of an international force to restore its territorial integrity. He said his country also supported efforts to restore peace and security to the eastern Democratic Republic of the Congo, which was essential to the stability of that country, as well as the region. In the Horn of Africa, progress on the Somali peace process had been encouraging, he said, adding that the creation of the federal Parliament, the adoption of the intermediate Constitution and the recent presidential election demonstrated the commitment of the Somali people, the Intergovernmental Authority for Development (IGAD), the African Union and the United Nations to peace, democracy and national reconciliation. Guinea also supported the current negotiations between the Governments of Sudan and South Sudan regarding post-independence issues, pursuant to the April 2011 African Union road map, endorsed by the Security Council. Concerning the Middle East, he said the restoration of lasting peace in the region required an independent Palestinian State living in peace and security alongside Israel. The situation in Syria was more alarming than ever before, and Guinea urged stakeholders to exert all efforts to halt the violence, protect civilians and restore peace. Turning to development, he said Rio+20 had provided the international community with the opportunity to renew its political commitment to sustainable development. Current priorities should include the effective implementation of the commitments undertaken, taking the legitimate concerns of all countries into account, especially those in Africa. Stressing that the continent remained the weakest link in the international development chain despite its enormous potential and economic performance of the last few years, he urged all partners to support its initiatives. Turning to developments in Guinea, he said the Government had undertaken a broad programme of democratization, as well as political, institutional, economic and social reform, and was hopeful that it would be able to hold legislative elections before the end of 2012. It had also called for the support of the Peacebuilding Commission in three priority areas: reconciliation and national unity; security reform; and youth and women’s employment.